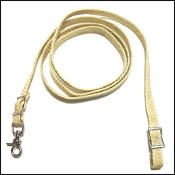 These waxed nylon reins are ideal for trail riders and competitive riders. 3/4" five-plait solid braid design makes them comfortable and easy to grip. Conway buckles for easy adjustment.